Most Popular Game Time Snack? I just saw this interesting infographic from Discover and apparently pizza is the #1 game food for college football fans and the way some people unknowingly “lose their tight ends” during football season. So I thought I’d offer a recipe for thought, my whole wheat crust that you can prep a few days ahead of game night and add your own skinny toppings. Stay fit and keep it delicious team Skinny Chef! I’ve tested so many different pizza dough recipes and this one is a combination of them. 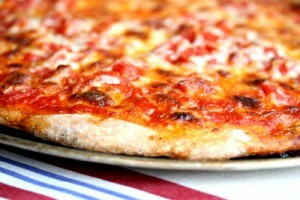 A great pizza has a crispy outer crust with a soft textured dough on the inside, baked perfectly in the hottest of ovens. If your oven doesn’t go up to 500° F or higher, I suggest purchasing an inexpensive pizza stone . Use your creativity to top this tasty crust. If you are using meats, seafood, or dense vegetables, precook them before topping your pizza. Mix 2 1/2 cups flour, the yeast, and salt in a food processor fitted with a dough blade or a standing mixer with a dough hook. While the food processor or mixer is running, gradually add 1 cup of the water until the dough collects in a ball around the blade or dough hook. Adjust the texture of the dough by adding additional warm water if it's too dry, or a little flour if it's too wet as you mix or pulse it in the processor. It should have a soft and supple but not sticky texture, and should spring softly to the touch. I like to take mine out of the food processor and knead it a few times by hand to make sure the consistency is still soft but elastic. Coat a large bowl with cooking spray. Place the dough inside, and cover with plastic wrap to rest at room temperature 1 to 2 hours. After the dough has doubled in size, punch it down and flatten it on a pizza pan or screen. Preheat oven as high as it will go. Cover the dough with a dry dishtowel and rest an additional 15 to 20 minutes. Remove the towel and top with tomatoes, cheese, and fresh basil. Sprinkle with salt to taste and drizzle with the olive oil. Bake for 15 to 20 minutes until the crust browns around the edges and the cheese is bubbly. Serve immediately. Nutritional Stats Per Serving (1 slice): 255 calories, 13 g protein, 34 g carbohydrates, 6 g fat (3 g saturated), 17 mg cholesterol, 5 g fiber, 491 mg sodium.